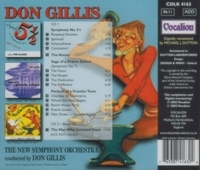 “Don Gillis was a composer who was in the mold of Roy Harris or Howard Hanson. His work was exceptionally well suited to the requirements of radio's Golden Age in which he worked as a producer, serving closely with Arturo Toscanini, the NBC Symphony, and the Symphony of the Air that he sometimes conducted. Radio composers wrote music that was direct and had a clear, dramatic component, and the degree to which they absorbed modernistic elements varied. Bernard Herrmann and Raymond Scott worked for CBS, and their radio scores could be surprisingly advanced sounding, as William Paley encouraged that to an extent, he wanted CBS to be recognized as the network of progress and sophisticated tastes. NBC, headed by David Sarnoff, was devoted to high culture with a capital ‘C’, and a good deal more conservative than CBS in its musical tastes, employing solid composers whose music was no more radical than, say, that of Ferde Grofé. Although Gillis was born in Mississippi, he was raised and educated in Texas, and even looked a little like LBJ. The Symphony #5 ½, ‘A Symphony for Fun’, is Gillis' best-known work and a little masterpiece, mixing up dance-band scoring, broadly stated Americana, Spike Jones-like sound effects, and other elements into a short ‘half-symphony’ only lasting 15 minutes. It was so popular in its time that even Toscanini conducted it.